If are a new blogger,you may have seen an email subscrtiption form like the below one in other blogs while browsing. 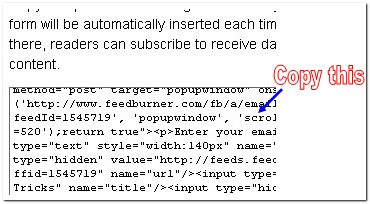 It is delevered by FeedBurner.When people subscribe,they will recieve a email with your blog posts whenever your blog is updated.It is a very easy thing and make your visitors come back again and again to your blog. 3.Next,Click on the 'Publicize' tab as shown below. 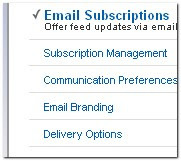 6.If you look at the sidebar now,there are a few more options under the Email Subscriptions column namely Subscription Management,Communication Preferences,Email Branding and Delivery options.Edit them according to your needs. and paste the code and SAVE THE CHANGES. That's it!..........too long process know? No.Very simple process to do. Great Post! I had been searching on how to do this - Thank You! I wanted to add that you can also scroll past the code and you can select the widget to be added to your blog directly which a handy little tool!! I can't tell you how much your articles are helpful for a newbie like me. 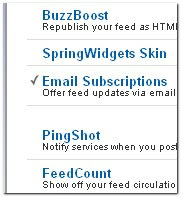 cold you explain how to put the same kind of thing (subscription via email) at the end of each post? i have figured out how to do it with subscription that use a webreader but i want to do it where people are emailed about the updates, just like you have at the ned of this post. Like previous commenter empaige, i too would like to use simple email feature where those who subscribe are sent URL link of new posts by email. Thank you so much. Little did I know that I could add this feature with the tools that I already had. Honestly, I never would have known this way if I hadn't stumbled onto your site. You're descriptions are awesome. I felt like I had someone sitting beside me guiding me through the process. Thanks again. I was struggling with this till found your site with such awesome instructions - thank you so much. I've added this on to my blogsite. Keep up the good work ! excellent! !I've been searching all over for this. I've put it on my site. Feedburner is giving 'trouble at mill' problem now a days. Can you help about this? Nice post. It helped me to add this to my blog. I am really stuck I have been trying to to add a subscription link to my blog since it started. I get all the way to the end of the insrtuctions but once I get the the html page it won't let me add the code. can someone tell me what I am doing wrong? Thanks! Thanks! This is very helpful! I used it on my site .. I have tried to do this for ages, this is the best!!! Hello man your tips are great Thanks !!! Thanx alot.....I'm searching for this option only..
thanks a lot... i've been searching for how to do this for a while..thanks a ton! i want 2 create a 'Post a Recipe'FORM for my recipes blog.so plz help me,how 2 create it. I was looking for that. And do you know if can I have e-mail list of my subscribers? Very nice I will use this on my blog, thanks buddy. Like a couple of comments stated above, I would like to use simple email feature where those who subscribe are sent URL link of new posts by email, and maybe the title of the post too, but no post content is included in the email notification. hope you can help- been looking everywhere for this. After wasting hours trying to embed a Twitter badge, this was just what I needed. Thank you for the tips and for the very clear directions! I'm going to surf around your site and see what else I can do. 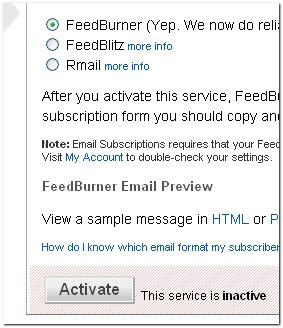 Tempting - but FeedBurner sends the email out themselves - with no graphics and their own branding - not ok with me. when i suscribed to feedburner and done all the process the small widget shows ''6 LISTNERS'' but i need ''6 reacers'' in that whatto do for that.???? thanks for this post, but i have got a doubt.should i submit every new post to feedburner to send them as mail or placing the code in the website is enough..
thanks for this post, i am new to feedburner should i burner all the new post to feedburner? Every thing went fine until I got to the paste it part. Then was unable to paste anything and not exactly sure where to paste. Everything went fine until I tried to paste it in. Then I was unable to paste anything. Great stuff!. Really appreciate this blog. I kove you so much for your help!!!!!!!!!! I just did it on my BLOG/ Peru travel blog. Thanks, you made it easy! Is this code for blogger/blogspot only? Thanks a bunch for the easy tutorial. thanks a lot, this is so helpful!!! you made my day. Great artical, I think I'll add an email subscription to my site. Our group has a closed blog (using Blogger) that our members must log into. 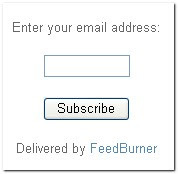 I have been trying to add FeedBurner to it so all our members could get email notifications of new posts. Blogger limits email subscriptions to 10 or 12. I found and old Blogger Forum (from 2007) where it was stated that FeedBurner will not work with password protected blogs. Is this still the case? Are there any suggestions for a workaround? Thanks a lot. Very helpful information. Using it I found some helpful information on Feedburner I didn't know about before :P Never really looked into everything. Thanks so much! Keep up the good work. Take care. Thank you very much! Been trying to find a simple way to do this for a very long time. Easy and useful! Keep it up, thanks for all you do. There isn't much info on this on the web. Thank you very much! Thanks! I just did this on my http://www.christnology.com blog since a lot of my audience are not familiar with RSS Feeds. Having e-mail subscriptions is a great option. The URL does not appear to reference a valid XML file. We encountered the following problem: Error on line 5: The element type "meta" must be terminated by the matching end-tag "<*/meta>". Please tell me what to do?!! I can make the feed appear on my blog, but I can't make it work. Do I need to change something in the settings of my blog? Thanks for your info, very useful. wow !! Thanks a lot !! Thanks so much! This was WAY easier than the directions given on Feedburner! thank you so much, i have just started putting together my blog today and this is the second time TODAY i have been successful in using the information on your site (adding categories, adding email subscription), when i was getting lost elsewhere!! great work! Feedburner is the best free option, for anyone out there consider Aweber or a paid alternative, checkout FeedmailPro.com first. Has some more advanced features but much cheaper than Aweber. Thank you so much! I had been searching every where within the blogger help with no luck. I found this going back to my good ole google search!!! Your instructions made everything so simple! Thanks again! very nice tips............ do u like to visit my Do-Follow site??? why i put the subscribe form the reader still cannot get my update ? Do you know how to create a contact / link exchange form? if you do could you do a tutorial on that? Great post - i have been looking for this for some time now! Thanks, used it and it works great help! Very bad! Feedburner only send with once a day and not when a new post/comment has been posted! Does the email go out as soon as you publish a new blog? Does it send the text? What if I edit it after the first publish?